Yes, we all have six packs / eight packs even. They are just usually covered by a layer of fat. Having a flat stomach or washboard abs is not just accomplished by working out daily, it has to become an all-encompassing lifestyle. The key components are healthy and lean diet, cardiovascular / resistance training, and abdominal exercises. If a movie star stomach is your goal, you must realize that to achieve your goal you have to first concentrate on what you eat, not how many situps you do in a day. Of course, as with any fitness and health goal nutrition and exercise are always the main ingredient. — Drink at least three liters of water per day (100 ounces). — Eat vegetables and fruits each day for workout energy and lean proteins for recovery / calories. — Eliminate fried foods and cheese. — Eliminate processed sugar (for example: sodas, cookies, candy). — Eliminate fatty red meat – only lean meats (1-2 times weekly). Diets like the Atkins diet and other high protein diets may help at first. To get rid of that last 10-15 pounds, it is recommended to lower calories to a range of 1500-2000 calories a day and to exercise rigorously both with core exercises and cardio work. Washboard abs, getting lean, and losing weight are all tied into a consistent cardiovascular workout program. You should do 30-45 minutes of activities like walking, running, biking, or swimming daily 4-5 times per week. It takes about four weeks before you start to see the physical benefits or your diet and exercise program. You will see almost immediate results in your energy level, overall mental alertness when exercising daily. Start off slowly if you have not trained with much intensity in the past several years. A good way to get started is to walk or run with the following six weeks program if you have been running / walking regularly. Note: Week #3 is non-impact due to high number of injuries that occur to legs (knees, shins, feet, hips) during the third week of beginning a walking or running program. Runners who are just starting out can find a 10-week beginner running plan of action here. #3 The Ab Exercises – You have to build ab muscles to see them! Even if your ab muscles are still hidden under fat – start now! The Ten-second Crunch is probably one of the best beginning exercises for firming up the belly. Simply lie on your back and lift your shoulder blades off the floor and hold for ten seconds. Repeat this at least for ten repetitions. Try repeating the 10 seconds crunch for 10 repetitions morning and night for starters. Also, stretch and flex your lower back for a few minutes after each set in order to balance the muscles that support your torso. However, a variety of abdominal exercises will help build the muscles under the fat. Now lose the fat by watching your diet and cardio vascular exercise and you will soon see the muscles! Hanging knee-ups — Bring your knees as high as you can as you hang from a pullup bar. Right Elbow to Left Knee — Cross your left leg over your right leg. Flex your stomach and twist to bring your right elbow to your left knee. Left Elbow to Right Knee — Same as above just switch sides. Cross your right leg over your leg. Flex your stomach and twist to bring your left elbow to your right knee. Hip rollers — This exercise will help you build your abs, back, and hips to help with long ocean swims and balance out the hip flexors exercises. Twist to both sides keeping your shoulders on the floor and stay in the bent knee position when rotating left and right. Lower Back Exercise — Lie on your stomach with your arms extended over your head. Lift your right arm and your left leg off the ground at the same time and repeat for specified number of repetitions. Switch arms/legs and repeat. Lower Back Exercise (Swimmers) — Lie on your stomach and lift your feet and knees off the floor by flutter kicking repeatedly as if you were swimming freestyle. Do not attempt to do these ab exercises if you are a beginner! These exercises are not healthy for weak or injured backs. If you cannot do the above swimmer exercises for 1:00 do not attempt these exercises. Situps — Lie on your back with your arms crossed over your chest, keeping your knees slightly bent. Raise your upper body off the floor by contracting your abdominal muscles. Touch your elbows to your thighs and repeat. Half Situps — With your hands on your hips, lift your torso off the ground higher than a crunch but not as high as a full situp. Your middle/lower back will be on the floor still at the up position. Flutterkicks — Place your hands under your hips. Lift your legs 6 inches off the floor and begin walking, raising each leg approximately 36 inches off the ground. Keep your legs straight and moving. This is a four count exercise. Leg levers — Lift your feet 6 inches off the floor. Raising both legs approximately 36 inches off the ground, keep your legs straight and off the floor until specified number of repetitions are complete. Scissors — Lay on your back. Lift your feet 6 inches off the floor. Open and close both legs approximately 36 inches apart, keep your legs straight and off the floor until specified number of repetitions are complete. Atomic situps — Lift your feet 6 inches off the floor as if you were doing a leg lever. Pull your knees toward your chest while simultaneously lifting your upper body off the floor. This is a mix between the situp and the leg lever. STEWART SMITH, USN, is a graduate of the U.S. Naval Academy, a former Navy SEAL, and author of several fitness books including The Complete Guide to Navy SEAL Fitness, The Special Ops Workout, Maximum Fitness, and The S.W.A.T. Workout. Stew has trained thousands of students for Navy SEAL, Special Forces, SWAT, FBI, ERT, and many other military, law enforcement, and fire fighter professions. He is currently the Special Ops Team Coach at the US Naval Academy that prepares future candidates for SEAL, EOD, and MARSOC training and runs a non-profit called Heroes of Tomorrow where he trains people seeking tactical professions for free. 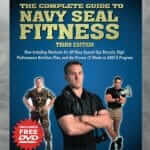 Military Fitness, Navy SEAL Fitness, Tactical Fitness, Workouts abdominal workouts permalink.